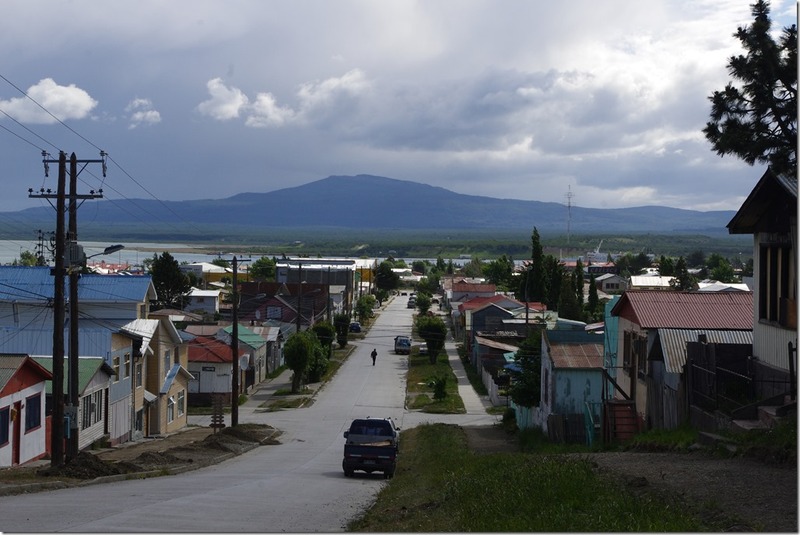 I’m quite impressed by Puerto Natales. 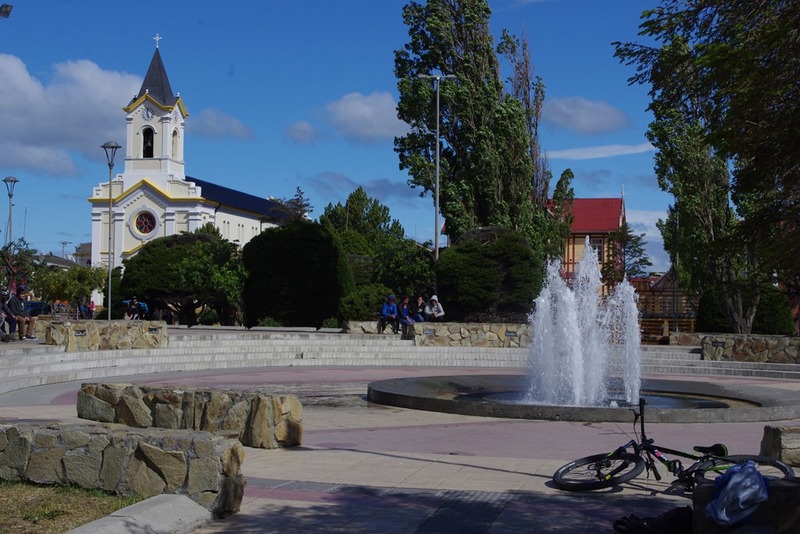 I only had half a day to look around, between getting off the boat and going to Torres del Paine National Park tomorrow, but it’s not a bad place for somewhere so far from anywhere else (Punta Arenas, where I’ll be heading on Wednesday, is about the nearest town, and that’s over 3 hours’ drive). It’s very obvious that Puerto Natales is a town in two halves. Around the fishing port, in the Eastern end of the city, I was struck by the simplicity. In common with some other high latitude places I’ve travelled, houses here are single-storey affairs cobbled together from whatever is to hand, whether wood or corrugated iron, and often a mixture. 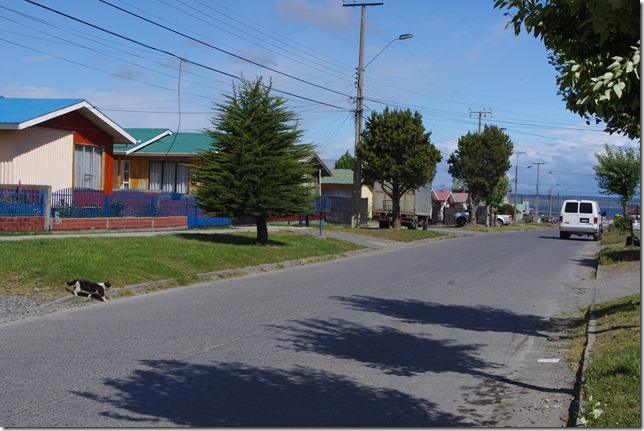 Despite this, the vast amount of the streets seem clean and tidy and, being wide roads designed on the American-style block system, it comes across as a very ordered place. The western side of town is very different. It’s the tourist area with the hostels and restaurants and a little more commerce. That said, Puerto Natales seems to strike the right balance between commercialism for the tourists and being an enjoyable, normal place. So, yes, some of the street signs around here are sponsored by Movistar, as I’d complained about in San Pedro de Atacama, but unlike San Pedro, I wasn’t disturbed at all by people asking me whether I wanted to go on a tour. Instead, there were local teenagers hanging out in the main square and playing with skateboards, just as in any other town. My hostel here is a little odd in that it appears to be the upstairs of a family home, complete with children audible downstairs. To add to that, the downstairs (which also has the breakfast area) is being remodelled, so al the furniture is pushed to one side and there are drills and bits of wet plaster hanging around. To be fair, the owner has been extremely apologetic for the disruption, which I’m perfectly happy with. After all, the bathroom’s quite nice and fully functional, which is a bit of a novelty after the last couple of weeks! Given the, erm, rather limited cuisine of the last few days, I decided to splash out a bit tonight and go to Don Jorge in the main square. This is a rather special restaurant which wouldn’t be to everyone’s taste. Outside, there’s what basically amounts to a large (whole storey high), glass-fronted, fume cabinet, in which a couple whole lambs were spit roasting. Inside the main restaurant is a barbeque. When I ordered the Patagonian lamb, the chef went into the cabinet outside with a meat cleaver, and hacked off a chunk of a leg from the lamb. After being sawn a bit more with a wood saw, this leg was then brought inside to finish on the barbeque, from where a couple of ribs were also picked up. Fast food this is not. An intercom system connects the barbeque to the main kitchen, so they can coordinate when all the ingredients of a meal will be ready. Needless to say, it was delicious, as was the Barberry mousse I had to finish. One postscript: I’d originally planned to go straight from the boat to Torres del Paine national park to camp there. I’m very glad I changed my mind and got a cheap hostel instead. Not only would it have been quite cold (the wind has indeed increased, as promised) but also camping in the national park seems to be really quite expensive and camping outside of official campsites is apparently being cracked down on, partly in response to the massive forest fire that affected the park 3 years ago. December 8, 2015 in chile.